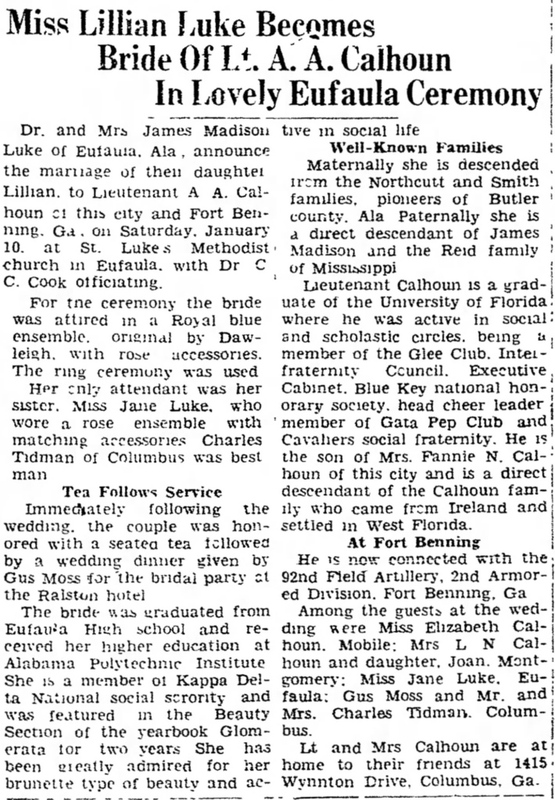 An article published in The Panama City News-Herald announcing the wedding for then-Lieutenant Aquilla A. Calhoun, Jr. and Lillian J. Luke (b. 1922). Born in Eufala, Luke attended Alabama Polytechnic Institute in Auburn and was a member of Kappa Delta National sorority. Captain Calhoun attended the University of Florida (UF) and graduated with a Bachelor of Arts. It was upon his graduation that Capt. Calhoun enlisted as a second lieutenant in the U.S. Army Reserves. After their wedding in January of 1942, the Calhouns moved to Columbus, Georgia, where Capt. Calhoun joined the 92nd Field Artillery's 2nd Armored Division. Capt. Calhoun participated in the Omaha Beach Normandy Invasions and played an integral role in liberating the town of Bresles, France. He later died during his service in France and is currently buried at the Epinal American Cemetery and Memorial in Dinozé, France. Calhoun is one of 85 Florida residents interned at Epinal. His death led to the creation of a tribute site and memorial in his honor in Bristles. 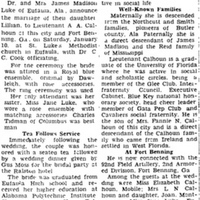 Digital reproduction of original newspaper article: "Miss Lillian Luke Becomes Bride of Lt. A. A. Calhoun in Lovely Eufaula Ceremony." The Panama City News-Herald, January 18, 1942. https://www.newspapers.com/image/39092405/?terms=Calhoun. Originally published by The Panama City News-Herald. Copyright to this resource is held by The Panama City News-Herald and is provided here by RICHES of Central Florida for educational purposes only. “Miss Lillian Luke Becomes Bride of Lt. A. A. Calhoun in Lovely Eufaula Ceremony.” RICHES of Central Florida accessed April 24, 2019, https://richesmi.cah.ucf.edu/omeka/items/show/6927.